The itinerary of this wartime escape route was way-marked, inaugurated and officially recognised by the French Presidency in 1994. It is a symbol and representative of many other routes across the Couserans area but paradoxically, although the longest and most difficult of all, it was the one most often used by local passeurs. Mainly because due to the complexity and extent of the terrain, the occupying forces were unable and often unwilling to maintain the necessary strict surveillance. 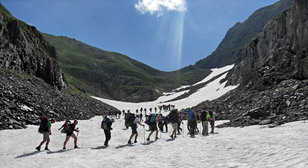 Every year, the Freedom Trail Association organises a commemorative hike which is open to the public and follows exactly the same mountain route. 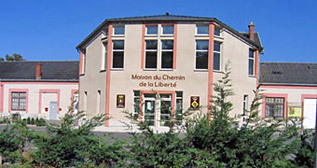 Full details of how to enter for this event can be obtained from the Saint-Girons Tourist Office or the Freedom Trail website. However, it is very important to warn all future participants that they must be physically fit, well-equipped and have done sufficient training to master the mountain conditions and high altitudes involved. Please read carefully the information given below concerning the different stages, walking distances and heights involved. 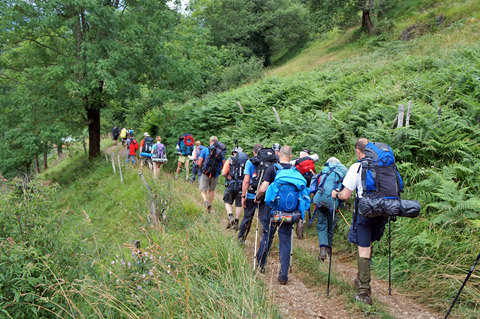 For a complete and in-depth coverage of this trek it is strongly advised to read the historical guidebook written by association member Scott Goodall, who is Scottish by birth but Couserannais by adoption ! Available in both English and French ("The Freedom Trail" and "Le Chemin de la Liberté"), it gives an exact and detailed account of the hike itself and how it came to be such an interesting part of Ariège history. Rest assured that every participant, at one moment or another along this long and testing trail will feel intense emotion and a mixture of admiration and compassion to be walking in the footsteps of those men, women and children - many of them very young and many very old - who crossed the mountains all those years ago under infinitely more difficult conditions. Perpetuating the memory of those courageous evaders is the main purpose of our Freedom Trail Association. 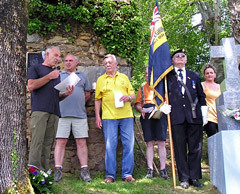 It is also important to remember that only three or four years earlier, during the tragic time of "La Retirada", many thousands of Spanish Republicans fled across the mountains to seek safety in France after their defeat by General Franco in the Spanish Civil War. The same routes through the Couserans were used in the opposite direction but under the same grim and dramatic conditions. Day 1 : From Saint-Girons (391 m) to the hamlet of Aunac (766 m). Distance : 23 km. Walking Time : 8 hours. The start of the trek is at the southern entrance to the town where an imposing iron bridge (now replaced by a modern concrete one), once spanned the River Salat and was an important rallying-point for fugitives during the Occupation. At 100 metres to the right on the road to Aulus-les-Bains and opposite the service station Relais de Guzet, the route goes up to the Beauregard housing estate from where a series of woodland paths climb above the villages of Eycheil, Lacourt and Alos on to the Col de l'Artigue at 880 m. It is here that a monument has been erected to the memory of 19 year-old Louis Barrau, a passeur who was betrayed, captured and shot by the Germans. The trail then descends to the Col d'Escots at 725 m and climbs again to end the first day's walk at 766 m in the hamlet of Aunac. Day 2 : From Aunac (766m) to La Cabane de Subéra (1,499 m). Distance : 16 km. Walking Time : 6 hours. It is from here on that the serious walking challenge begins as one rapidly reaches the majestic scenery of the high peaks. A glimpse of paradise in good weather, a foretaste of hell in a raging storm ! After passing the gîte d'étape or hostelry of Esbints, the path rises steeply to the Col de la Core (1,395 m). From there, descend on the road for 330 m and take the path on the right which leads to the Cabane de Casabède, on and up to the Col de Soularil (1579m), then down to la Cabane de Subéra (1,499 m) where we pitch tents for the night. The following morning a second group of walkers arrive from the Col de la Core to join in for the last two days of the hike. Day 3 : From la Cabane de Subéra (1,499 m) to the Refuge des Estagnous (2,245 m). Distance : 13 km. Walking Time 8 hours. 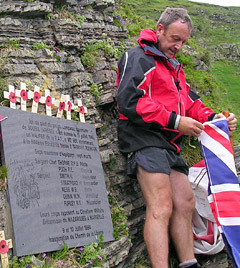 The ascent now becomes very much steeper and after two hours of climbing we arrive at the base of the Pic de Lampau where a plaque has been placed near the wreckage of a British Halifax bomber in memory of the seven crew members who died there when their aircraft crashed into the mountain on the 19th of July 1945. 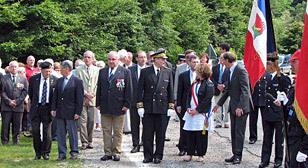 There is a short ceremony of remembrance and the climb continues over the Col de Crabérous (2,382 m) and descends to the Cabane d'Espugue (2,110 m). 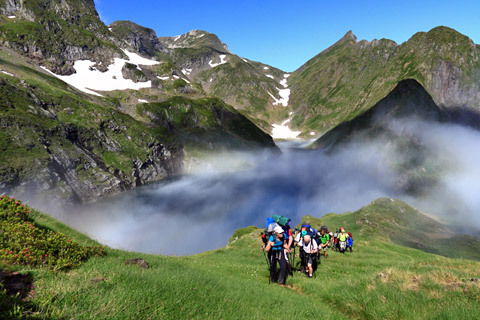 Then, after passing the lake or l'Étang de Cruzous, there is a stiff climb to the Col de Pécouch (2,494 m), followed by a final descent to the Refuge des Estagnous (2,245 m), where all walkers spend the night. Day 4 : From the Refuge des Estagnous (2,245 m) to Alos d'Asil (1,200 m). Distance : 20 km. Walking Time : 7 hours. From this refuge which saved hundreds of lives during the war and has now been completely rebuilt after many years of neglect, we descend at first to l'Étang Rond (the Round Lake 1,929 m), then climb very steeply up to l'Étang Long (the Long Lake 2,125 m). The Spanish frontier is reached after a slow, arduous climb to the Col de Claouère at 2,500 m. This is followed by a steep descent into Spain to reach the River Noguera Pallaresa where a track winds along a valley to the village of Alos d'Isil (1,200 m) and the end of this difficult route. Within walking distance is the village of Esterri d'Aneu, not far from the prison in Sort which for so many was the final destination after their long and perilous crossing.